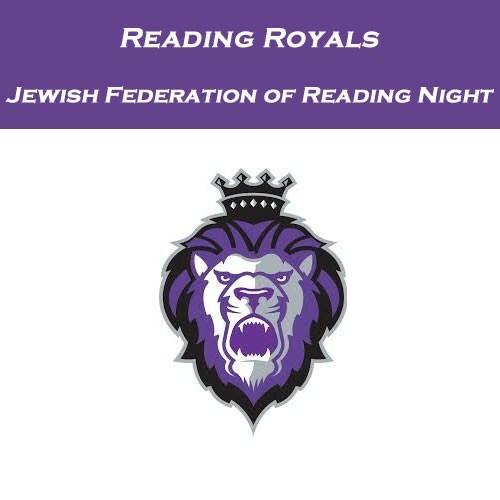 Jewish Heritage Night at the Reading Royals | Jewish Federation of Reading Pa., Inc.
seating with special access to the Coke Lounge, an area for our group to gather and socialize. Snacks and soft drinks are included in the ticket price. Everyone who purchases tickets through our group link will be given a free item at the game. Another special treat will be the High Five Tunnel Experience. This experience allows guests in our group to greet players as they go out on the ice at the start of the game. If you have any questions or issues purchasing tickets please contact Amanda Hornberger at amandah@ jfreading.org or 610-921-0624. We look forward to sharing an afternoon of Royals hockey with you on Feb. 3!